The climb up the tallest mountain in the world is no small feat, but even just getting to the base camp is a trek all in itself. But climbing Mount Everest is not the only way to enjoy its beauty. Travelers can trek to certain points and villages and needn’t go all the way to the Southern Base Camp to see Mount Everest. Many people will make the trek at least part way stopping at villages that offer a glimpse of Mount Everest. Our Everest Explorer Journal hand-made in Nepal is named after this natural wonder. Arriving by plane to the Lukla Airport can be an adventure all by itself. 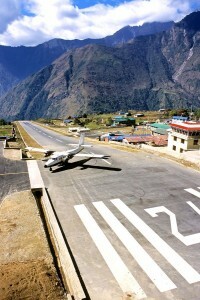 Officially Tenzing-Hillary Airport, Lukla Airport was rated as one of the most dangerous airports in the world. Daily flights between Kathmandu and Lukla Airport occur during good weather. A list of accidents can be found on the Lukla Airport Wikipedia page. Helicopter rides can also be arranged to Lukla. From Lulka, adventurers can then walk the trail stopping at various villages and points offering vista views of Mount Everest. The trek takes a number of days to complete, so be prepared. Below is a film made by Celtic Video detailing the trip from Lukla. It can take two to three days of walking/hiking to get from Lukla to Namche (pictured below). It is located within the Khumbu area at 3,440 metres (11,286 ft) at its low point, populating the sides of a hill. Most of Sherpa are in the tourism business, specially from Namche area, Namche is the main trading center and hub for the Khumbu region with many Nepalese officials, a police check, post and a bank. Namche is the most expensive place in Nepal, at least thrice as expensive as the capital city Kathmandu. About a one to two hour walk/hike from Namche Bazaar is the Hotel Everest View, the highest hotel in the world. From the hotel, you have stunning view of Everest. But trekking for days from Lukla is not the only way to get to the hotel. You can fly by helicopter from Lukla arriving at the Syangboche airstrip which is about a 45 minute walk to the Hotel. This can be a very popular method to see the views and then hike to Namche and the surrounding areas. Many beautiful villages can be hiked to from the hotel including Khumjung village where a scalp said to be from a Yeti is on display at the monastery. However you choose to go, or wherever you decide to explore, enjoy your trip, savor the moments, and capture your adventure through pictures or written in a journal to remember and cherish.